The only thing to shock Rafael Nadal at the French Open yesterday was the resignation of Real Madrid coach Zinedine Zidane. Real fan Nadal heard the news that the Champions League-winning boss was leaving before he took on Argentina's Guido Pella. "Of course it was a surprise for everybody, no?" he said. "But at the same time, Zidane is a top person. He's a person that it is tough to accept that he's leaving. "He has always been positive and believing in the players and on the club. He deserves to choose what's better for him." That was where the shocks ended, though, as the world No 1 and 10-time champion dropped just four games in a comprehensive 6-2, 6-1, 6-1 victory. 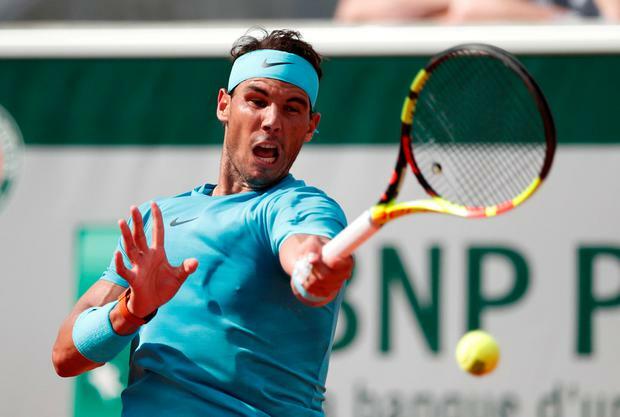 Nadal admitted he took things a little too easy in dispatching lucky loser Simone Bolelli in straight sets over two days in the first round, but definitely moved up a gear against Pella. The world No 78 put up a decent fight, especially in the first set with some classy winners. But facing deuce after deuce on his own serve, with Nadal pounding away from the back of the court, he understandably wilted. "I have to be happy, no?" added Nadal. "It's of course a great result. It's not possible without playing well." Nadal will face France's 29th seed Richard Gasquet in the third round. Marin Cilic, the third seed from Croatia, did not have things all his own way against Hubert Hurkacz of Poland. Cilic led by two sets but dropped the third on a tie-break before going on to win 6-2 6-2 6-7 (3/7) 7-5. Serena Williams came from a set down to book her place in the third round after calling on some of her vintage super powers to get past Ashleigh Barty. But from somewhere Williams got her serve firing and summoned up her powerful groundstrokes to blow Barty away 3-6, 6-3, 6-4. "I lost the first set and I thought 'I've got to try harder'," she said. "Then Serena came out."